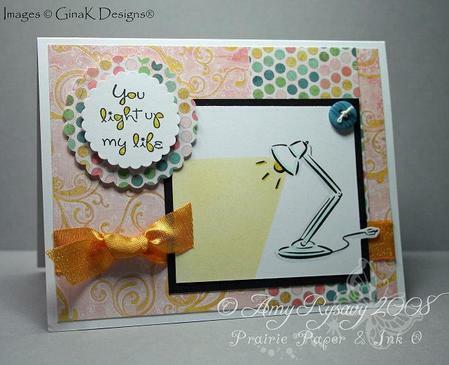 Like last week I used GinaK's Heartfelt Hits I stamp set - I love this lamp stamp LOL! It's kind of hard to tell but the darker yellow on the bulb and in the lettering is a Copic Spica Lemon Glitter Pen - nice and shimmery in real life! I made the "lamplight" by masking off the card stock with a couple of sticky notes (and covering the exposed part of the lamp with another sticky note) then using a stipple brush and Stampin' Up! Barely Banana ink. The patterned paper is Basic Grey Two Scoops, as is the button. The ribbon is May Arts. If you upload your card using this sketch to any public galleries please use the keyword AMYRS16 to make it easier to find. 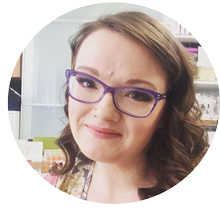 And don't forget to link directly to your creation in the comment section of this post so that I can see it too!